Cocoa and Carols and Excellence! 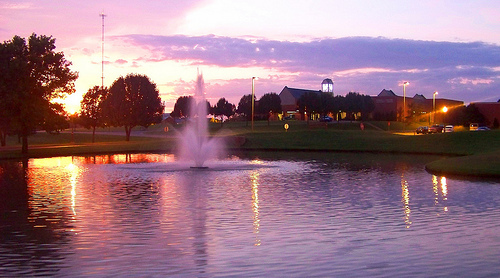 Oklahoma Christian University has been a best-kept secret for too many years! Last night Sherrylee and I were on their campus again for the 35th Annual Cocoa and Carols, a wonderful program that our dear friend Dr. Ken Adams has produced and directed from its inception. He is retiring at the end of this year after forty-one years at OC, so we especially wanted be there to share it with him and his wife Lindy. One of the reasons I enjoyed teaching at Oklahoma Christian for so long was that OC has always been committed to excellence, and excellence is difficult to pull off when you are small and in the middle of Oklahoma! Cocoa and Carols is a great example of this kind of excellence, however. For thirty-five years, Oklahoma Christian has offered its community a classical Christmas program, almost always using a full professional orchestra to accompany its own student choir. Each year they offer their audience a master work by not only the likes of Bach or Mozart, but also modern composers like the Gloria by John Rutter this year! (You can find excerpts of this modern classic on Youtube, if you are unfamiliar with the work like I was.) And this Christmas gift has always been given free to the public! I love it! I’ve always believed OC has had an excellent academic program, if anyone cares about that anymore! OC has strong majors in sciences, with an excellent record in students going into medical school and other health-related fields. The school of business is highly recognized and the MBA program is one of the best in the State of Oklahoma. OC has an outstanding engineering program, with a very hands on approach because many of the engineering professors have come directly from their industry to join OC’s faculty. Of course, I’m a big fan of the liberal arts, so I can say that OC’s English department, history and political science departments, music department, art and graphic design areas all have outstanding professors and, though small, give their students just as much with more personal interaction than is really possible at larger schools. And I do believe that Oklahoma Christian is still committed to delivering a Christian education, something that not even all colleges with Christian in their name are doing any more. You can go to church with your professors, or work in inner city missions with them—not just your Bible professors, but your accounting or your biology professor as well. They may invite you to join them on an overseas mission project during summer break, or they may just sit down with you in the coffee shop to check on your life! I was trying to decide what keeps Oklahoma Christian hidden from the mainstream of Christian education. Part of the answer is its location—Oklahoma. I have a friend here in Fort Worth, who although living only about 100 miles away from the Sooner state for decades, had never been to Oklahoma. It’s not Malibu! Sherrylee would admit to thinking that God had made a big mistake when He sent us to Oklahoma Christian in 1979. We thought He had taken us way off the map, but I can truly say now, that our years in Oklahoma were just wonderful! And, although Oklahoma Christian likes to identify itself with the Oklahoma City community, the town of Edmond, to which it truly belongs, was selected in 2011 #1 on CNBC’s “10 Perfect Suburbs” list! Let’s don’t keep Oklahoma Christian a secret! It’s not perfect! It’s not the right university for every student! But don’t skip over it just because . . . . You and/or your student might find a wonderful oasis of people who love God and who are committed to offering excellence. Thank you, thank you to people like Ken and Lindy, to Stafford and Bailey, to Ron and James and Lynn and Bill and John and Joe and Elmo and Kim and so many others who have committed the major years of their lives to teaching young people to be excellent Christians! I am building a list of the 50 most affordable christian colleges and universities and would like to use your picture of the campus in this list and feature this institution. Can I get your permission to do this? Please ask Oklahoma Christian directly for permission. Wow, great encouragement Mark! You need to help me recruit students! Mark, what a wonderful tribute to your former colleagues at Oklahoma Christian University. You are right about it being a best-kept secret, but we are seeking to tell the story better. You just helped us. We couldn’t have written your script better. Thanks. Grace and peace for a blessed Christmas season and a wonderful 2012. PS. It is always nice to see you and Sherrylee on campus. Thanks, Mike. You have provided great leadership and OC is in a great place because of what you have done during your presidency. Merry Christmas to you and Nancy and to your whole family as well.